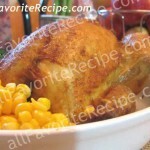 In a bowl, combine chicken, egg white, flour, cornstarch, salt and pepper. Let stand for 10 minutes. In a wok (or large skillet), heat oil over medium-high heat. Stir-fry chicken in batches (reserving cornstarch mixture in bowl), for 3 minutes or until golden-brown. Transfer to a plate. Using the same bowl use to marinate chicken (cornstarch mixture still in bowl), add broth, 1/3 cup (75 mL) water, soy sauce, sherry (if using), rice vinegar, ketchup, sugar, and ginger. Whisk to combine. Set aside. Discard all but 1 tbsp (15 mL) oil from wok. Stir-fry onion and red and green peppers for about 3 minutes or until tender-crisp. Add chicken, pineapple and stock mixture to wok. 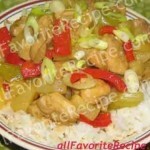 Stir-fry for 2 to 3 minutes or until thickened and chicken is coated. Have You Tried These Other Chicken Pasta Recipes?